Audrey Hepburn stars in The Nun's Story as Sister Luke, postulant of a Belgian order of nuns. Though frequently disillusioned in her efforts to spread good will -- at one point she is nearly killed by a mental patient (Colleen Dewhurst) -- Sister Luke perseveres. Sent as a nurse to the Belgian Congo, an assignment she'd been hoping for, Sister Luke is disappointed to learn that she will not be ministering to the natives but to European patients. Through the example of no-nonsense chief surgeon Peter Finch, the nun sheds her idealism and becomes a diligent worker -- so much so that she contracts tuberculosis. Upon the outbreak of World War II, Sister Luke tries to honor the edicts of her order and not take sides, but this becomes impossible when her father (Dean Jagger) is killed by the Nazis. Realizing that she cannot remain true to her vows, Sister Luke leaves the order and returns to "civilian" life. The Nun's Story ends with a long, silent sequence in which Sister Luke divests herself of her religious robes, dons street garb, and walks out to an uncertain future. There is no background music: director Fred Zinnemann decided that "triumphant" music would indicate that Sister Luke's decision was the right one, while "tragic" music would suggest that she is doing wrong. Rather than make an editorial comment, the director decided against music, allowing the audience members to fill in the blanks themselves. 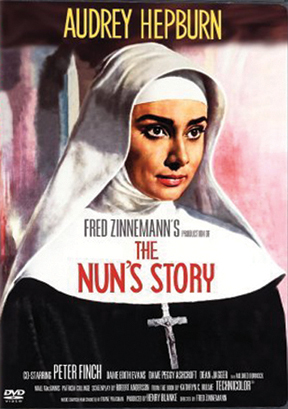 The Nun's Story is based on the autobiographical book by Kathryn Hulme, whose depiction of convent life was a lot harsher and more judgmental than anything seen in the film.